Teaching kids about giving can be rewarding for both parents and the children. Learning about giving and helping others gives children a feeling of empowerment in an uncertain world where unexpected and frightening events happen every day. A great way to reinforce charitable values is to make giving a family activity. Encourage everyone in your household to participate in volunteer activities, and praise your children when they show generosity and empathy to others. It is especially important to teach youth that they are part of a larger community and that we are all responsible for those around us. By giving the value of charity a central role in the family dynamic, you encourage your child to grow up with a healthy sense of compassion and a strong charitable spirit. What Age Should We Introduce Our Children to the Idea of Charity? Parents should introduce their children to charitable giving when they are around three or four years old. Very young children often don't realize that other people have feelings, ideas, and emotions of their own. By the time they turn three, children begin to understand and respect the fact that each and every one of us has an inner life. Knowing that other people have feelings, children can begin to develop and hone a sense of empathy; this capacity for empathy is the very basis for charity. How Can We Set A Good Example As Parents? It's important for parents to create a family environment where giving is natural and encouraged. It is good for children to see their parents donating charitably and, just as important, they should see what a privilege it is for their parents to be able to give. Include your children in your own volunteer or charity activities. Let them see you dropping money into charity boxes. Encourage them to help you pick out canned foods during a food drive, or let them tag along when you participate in a walk for breast cancer. Each time your child sees you giving to charity, it reinforces good behavior and gives you an opportunity to explain why it is important to give and how rewarding charity can be. What Are Different Ways To Give? There are many ways a child can learn the value of giving and plenty of volunteer ideas for kids. Setting up a charity box in the home can show how even a little bit of money can make a difference when given with a good heart. Encourage them to donate old toys, school supplies, and clothing to other needy children. It is also a good idea to teach your little ones that donating time is often just as powerful as donating money and things. 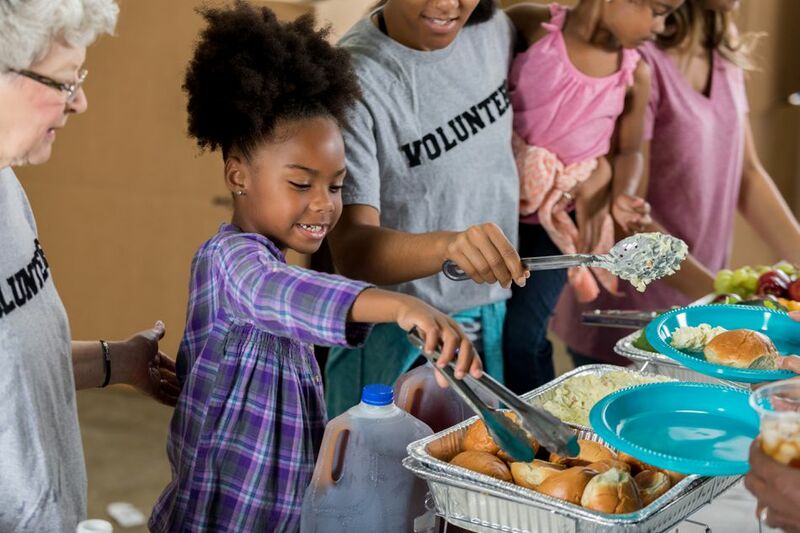 Take the whole family for an outing serving dinner at a local soup kitchen or make a habit of keeping a basket of fruit or snacks in the car to give to hungry people in need. How Can We Involve Our Children in Volunteer and Charitable Activities? It is easier for younger children to understand more direct and concrete examples of charitable giving. They know they love their favorite toys and dolls, so you can explain to them that not everyone is fortunate to have toys to play with. Encouraging them to donate toys they've outgrown will help them see that they can make a real difference in other people's lives. Help them donate clothes they've outgrown to other girls and boys. Likewise, you can help them set up a charity box to which they can contribute part of their allowance or loose change. Making philanthropic donations a regular activity around the house will reinforce charitable values in your children's lives.